When I first met the man who would become my husband, we were attending German classes in downtown Florence (don’t ask). 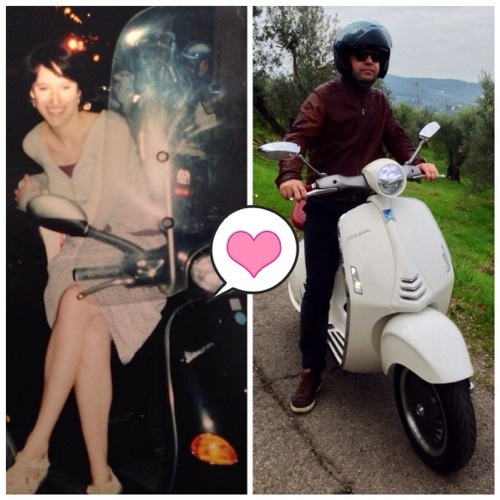 Often, after the lesson was over, Tommaso would offer me a ride… on his Vespa. He had a black Vespa ET4, a new model rather than the classic machine, and he prided himself on wearing a helmet and carrying a spare, too. This he used to try to convince me to get on the thing, but I remained both firmly prude and honestly scared. But both the vehicle and the man would soon win me over. I finally got on that Vespa in the summer of 2000, when I agreed to go on a “group date” with him and some friends who were going to a Sting concert. It was in the Cascine Park and cost 15,000 lira. I still have the ticket. He picked me up on the way to the concert and I gingerly climbed aboard, looking for some way to hold on that did not involve pressing my breasts into his back. After the concert, which was an amazing feeling not jut for Sting and the crowd and the discovery of Nicolo Fabi, who opened that night, but for a nascent electrical feeling between us, I hugged him tightly. It was cold. It was a good excuse. 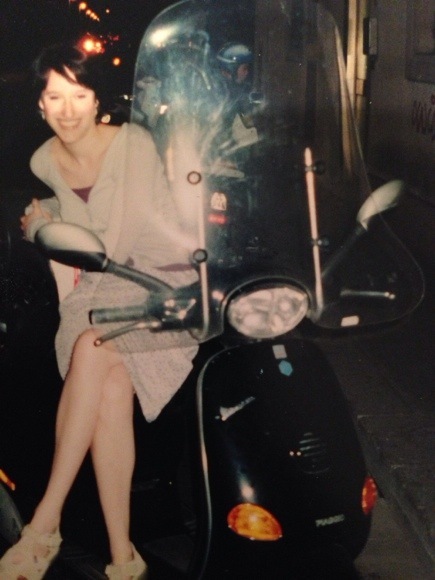 Me in summer 2000 on Tommaso’s Vespa, parked in front of a “secret bakery” that is open at 1am. We were young! And so it was midnight in a late 90s summer in Florence when I first experienced the power of blasting around town as a group on the Vespa. The crowd of friends left the concert and jetted around, shouting from one vehicle to the other, and in hindsight I think “no wonder the Vespa is an Italian icon,” although at the time I was thinking that this guy in front of me was very sweet. We ended up eating pizza at Bondi behind the San Lorenzo market, which is open late, and for me this marked my first real social Italian experience. A group experience, traveling in packs, meeting up at one point and with the flexibility to stop, converse, and change plans at any time. The vehicle and this kind of sociability mark some of the freest young days and nights I have had in this city. Years went by and we got older, no longer traveling around in casual groups, but occasionally meeting up for dinners as couples, many of whom had moved on to cars with child seats. That Vespa started up one morning of every two, and we dreamed of owning a newer one, perhaps in a fun colour (that was my main factor). I found a brand new Vespa 125s on E-Bay some time around 2009 and we drove to Modena to pick it up – a guy had won it in a raffle at work and it was still at the dealership there. A great deal! Tommaso drives this scooter to work every day, rain or shine, and most mornings I try to get a ride into downtown with him. 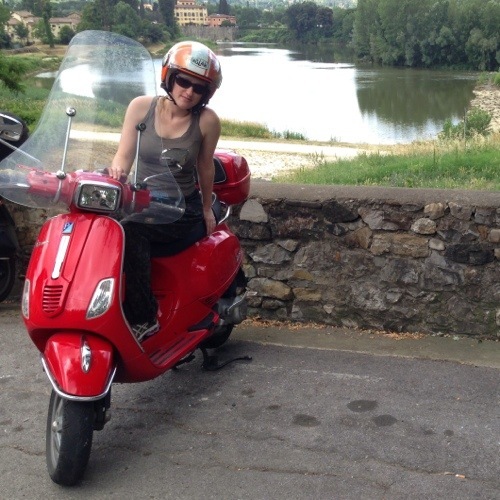 There’s no faster way in traffic than to ride a scooter – in Florence it’s pretty essential. Still, I have not learned to ride one: my husband says he’s been doing it since he was a kid, but that I’d be likely to kill myself within 6 months, and he’s probably right. Our red Vespa is still going, but this week we’re really excited to be test driving a just released Vespa 946. This is a special edition, handmade vehicle that is a throwback to some of the earliest designs for the Vespa, streamlined to be a highly desirable design object. Will it be our next Vespa? who knows!